This is just a teaser. If you want to read the first three chapters click here. Last excerpt our female protagonist, Nicky, asked a complete stranger if he'd give her a ride because she was depressed about her father’s death and ticked off at her boyfriend. Let’s get a glimpse of what she saw in this stranger. Nicky accepted the helmet, latched it under her chin, and walked around to the left-hand side of the bike. She climbed on lithely and then wrapped her arms around his waist. “You’ve rode before,” he stated matter-of-factly. Obviously the fact that she’d gotten on the correct side had tipped him off. Nicky held onto the stranger’s waist as he pulled carefully out of the parking lot, nothing like Jonathan would’ve. He was handsome. He had one of those faces that were just pleasant to look at, one that you couldn’t help but instantly trust. His face was round and kind looking with a tiny cleft in his chin. He didn’t smile much, but the one time he almost did, when she’d asked for a ride, she could see the semblance of a dimple on his cheek. His hair was sandy brown and his eyes a deep hazel. He was taller than she was and that was saying a lot. A little overdressed though. Why would anyone go out on a Saturday night in dress pants and a button-down collared shirt and tie? And on a motorcycle, nonetheless. The air was cool as they passed over the causeway heading toward Cocoa Beach. She definitely wasn’t dressed to ride. Even the warm August evening felt chilly on the back of a bike going sixty. Nicky crouched lower, an attempt to block the wind. Her hands gripped tighter, seeking warmth. He retracted one hand from the bar, doing his best to cover her arms with his arm. She melted at the notion. He was considerate. Nicky turned her head in both directions. “Um, take a left and head toward Port Canaveral.” She hadn’t thought this far ahead, but suddenly she knew exactly what she wanted to do. Something she hadn’t done since she was seventeen. He shrugged and pulled into the parking lot. Nicky jumped off the bike, ran into the store, and bought a little bottle of Jim Beam. Next, she ran across the street instead of returning to his bike, motioning for him to follow. Thankfully, he did. She purchased two super-sized cherry Slurpees and asked the cashier to put them in a paper bag. He looked over his shoulder at her as if questioning her sanity, and in a way, he was right. She’d just jumped on the back of a motorcycle of a complete stranger. A very good-looking stranger though. She was going to start putting forth her new life, taking what she wanted. And right now, she wanted to go to the beach, get drunk, and wash away her sorrows for at least one night. “It ends at the beach,” he replied coolly. Interesting. I see her point about the motorcycle. Why isn't he wearing the proper protective gear, I wonder? LOL, Kate. 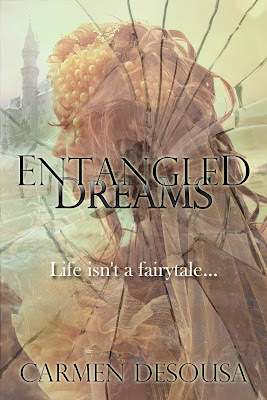 I had to skip a few sentences to catch up to the good stuff before ENTANGLED DREAMS publishes next month. But to answer your spot-on question, he gave his helmet to her. As always, at the end of the day, I'll fill in all the gaps, so the excerpt is complete. I was hoping to get my friends the first three chapters via Six Sentence Sunday in order, but the time creeped up on me. I'll head over to your post in a bit. Thanks for stopping by. She sounds intrigued!! Great six!! Great six Carmen! At least he's a kind enough guy to give her his helmet but why would a guy be all dressed up on a motorcycle? I'm intrigued. Great six! It's got me wondering. Hmm, terrific description as always. I can really "see" him - great six!